St. James School in Depew where preschoolers age three to five-years-old are instructed through a program called PEDALS. Acitivites for preschools at St. James Head Start. Mental health and social-emotional behavior continues to take center stage in education. 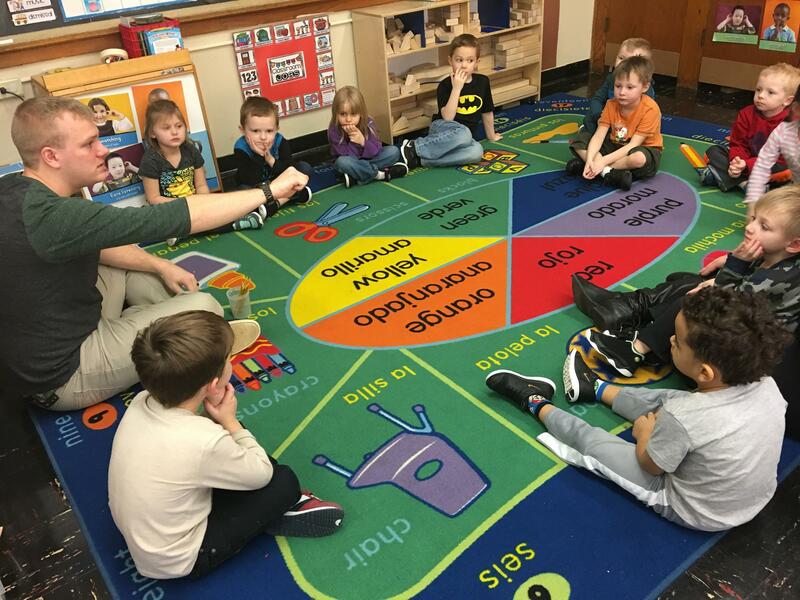 WBFO's senior reporter Eileen Buckley recently visited a preschool classroom where young children are learning how to manage their emotions. 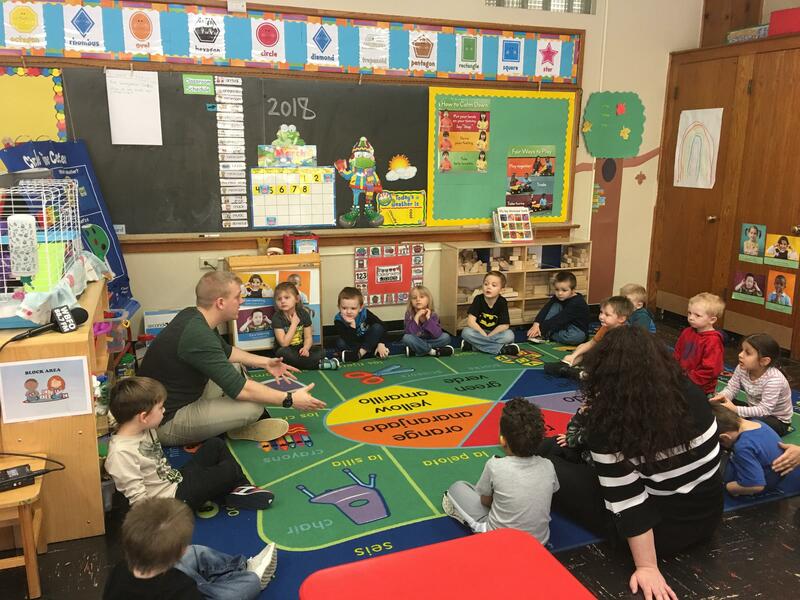 WBFO’s Eileen Buckley recently visited a preschool classroom where young children are learning how to manage their emotions. Educators say helping a child succeed in their future academics and changing bad behaviors starts with social-emotional skills. Allan Hittle, preschool teacher at St. James Head Start, works with young students. We visited the St. James Head Start in Depew where preschoolers age three to five-years-old are instructed through a program called PEDALS. The acronym stands for Positive Emotional Development and Learning Skills. These preschoolers are learning how to interact. “We had a lot of behavior issues at the beginning of the year when kids would first come in and that had no school at all and then working through, with the program, you see change almost immediately. There's a lot of catchy music and puppets and stuff, so they get into immediately,” said Allan Hittle, preschool teacher at St. James Head Start. Hittle tells WBFO News he uses what is called 'second step' in the PEDALS program for social emotional teaching. “Basically to help the kids learn to identify their own emotions, how their friends and peers and teachers all have emotions as well and how those play into their day – how they can handle those emotions. The feelings they have and interact with their friends in a different way,” explained . Hittle’s class began with children sitting in a circle singing about listening. “This is how we listen, this is how we listen,” the children sang. “Three year olds are very self-centered – not in a bad way, but they really only care about themselves and how they feel. Somewhere between three and five they learn that their not really the center of their universe – there’s other people, they make friends. I think making a friend and seeing a friend get sad or mad and learning they have that same kind of feelings you have kind of really opens it up,” Hittle remarked. “I've been involved with the PEDALS program since its inception. I've seen a growth from day one with these children,” said Kathy Karan, principal at St. James Head Start. Karan said all the classrooms at her school are using the PEDALS program. "This is home to them, so we need to make them feel comfortable, so when they express their feelings with them, when we say ‘how are you feeling today’, when they come in and they’re crying – they can express some of that to us and they feel so loved here and they just need that,” Karan commented. Over the last several years the Health Foundation of Western and Central New York has partnering with the Tower Foundation to help fund the PEDALS program at preschools in Erie and Niagara counties, especially reaching low-income neighborhoods. PEDALS is now in more than 150-classrooms in our western New York region reaching over 4,500 students. Both principal Karan and teacher Hittle say it is providing teachers will skills to support how to educate children about social emotional development and deals with difficult or bad behaviors. “If they came in and they were angry, what process would you go through, what tools you would use with them?” asked Buckley. “You know a lot of times when kids get dropped off in the morning, they don’t want mom and dad to leave, sometimes they do get sad, but some of them do get mad that they have to be at school all day. Basically is what we will do is we've got a safe place in the classroom. They can come and sit down and ask them why they feel angry and they can tell us and if they need to take deep breathes and kind of work through that, it just kind of gives them a tool to take control and ownership of their own emotions,” described Hittle. “If you can deal with your problems now and your feelings now, and you can get a handle on that – you’re just going to flourish so much more in life and just be able to cope. Coping mechanisms is such an important part for these children and their daily lives here. They need to start now to be able to get those mental feelings they deal with when they go to kindergarten,” Karan remarked. On the classroom bulletin board posters instruct students how to deal with emotions. “It’s such a big topic in education right now, because even just five years ago it really wasn’t, so hopefully giving these kids all these tools – learning to be kind to each other or even just learning how to handle their own emotions if someone isn’t kind to you – hopefully will open up a whole bunch of doors for these children,” Hittle declared. “How do we calm down? What’s the first think that we want to do?” Hittle asks the young students. “Put your hand on your belly and say stop!” answer a preschooler. On the classroom bulletin board there are posters; one teaches students about playing fair with others, the second instructs a child how to calm down it states "Put your hands on your tummy” and say "stop", name your “feeling” and take “belly” breaths – a technique educators say is removing bad behaviors. This weekend WNED is hosting KidFest. It will feature the popular PBS Kids character Daniel Tiger. WBFO's senior reporter Eileen Buckley says Daniel Tiger's Neighborhood is being used in some preschool classrooms to help develop social and life skills. 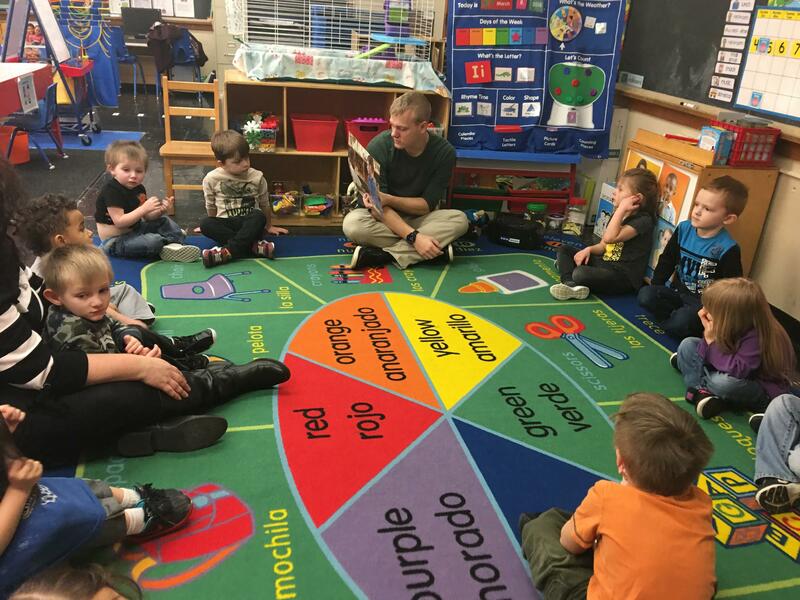 WBFO's senior reporter Eileen Buckley visits a preschool classroom at Saints Peter and Paul School in Williamsville where Daniel Tiger is incorporated into lessons.